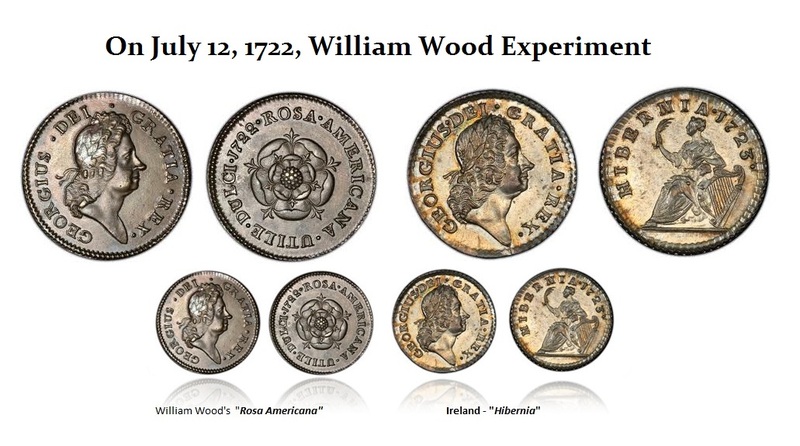 On July 12, 1722, William Wood (1671–1730), who was a hardware manufacturer, ironmaster, and mintmaster, received a contract from the British Crown to strike an issue of Irish coinage from 1722 to 1724. He also struck the ‘Rosa Americana’ coins of British America during the same period. Wood’s coinage was extremely unpopular in Ireland for being overvalued in monetary value compared to the intrinsic metal value. It was seen as the King attempting to create money from nothing or fiat despite the fact they were coins. The British coins minted for Ireland were recalled and exported to the American colonies. Wood was also granted a patent to mint 300 tons of coppers for the North American Colonies over a 14-year period for an annual fee to the Crown of £300.149. He produced the “Rosa Americana” coinage which was very attractive, but they were an alloy of 75% brass, 20% tutenague, 5% silver. One pound of the alloy was to produce 120 halfpence, which was a substantial profit of about doubling his money. The obverse depicted the laureated head of George I, while a Tudor rose with the inscription ROSA AMERICANA, UTILE DULCI was on the reverse. In response to the Wood contract by the British Crown, Massachusetts issued small change bills to compete with Wood’s Rosa Americana coinages being introduced into New England. They issued in 1722 this Hexagonal Three Pence, as well as a two and one pence paper note. This issue of small change paper notes was authorized in June 1722. 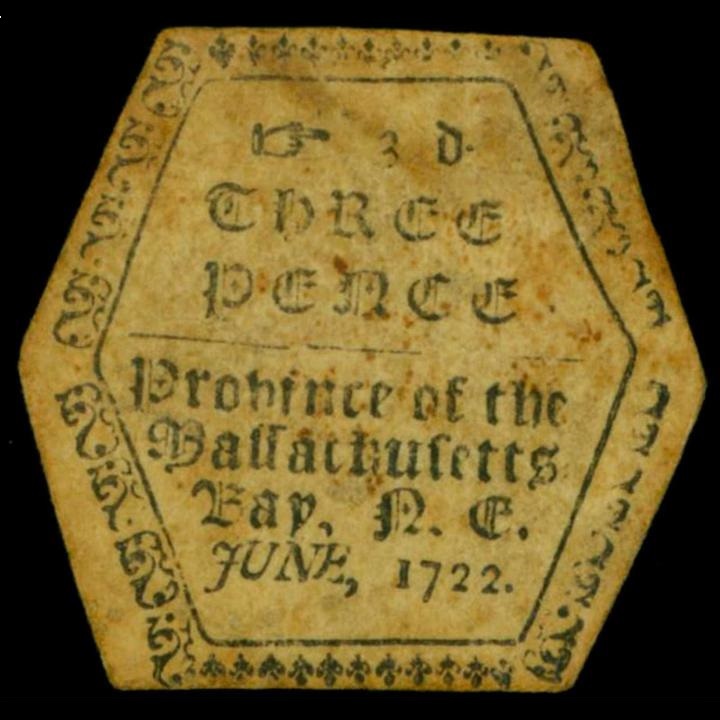 These geometrically shaped parchment notes were clearly authorized in Massachusetts in response to the Rosa Americana flood of coins from Britain. Wood’s effort was a failure as was his Hibernia series in Ireland. Their lightweight and overvaluation rendered them unacceptable as money by the American colonists as well as the Irish. Therefore, the rejection of Wood’s underweight coinage even took place during the extreme shortage of small change shortage that created a real crisis economically. The failure of the Rosa Americana series to be accepted by the Colonists is why so many of these coins remain in uncirculated condition today. Shortly before his death in 1730, Wood proposed to the Board of Trade that he mint coins in gold and silver for the colonies at 75% of the sterling rate once again a scheme to overvalue the coinage. This scheme was rejected by the Crown based upon his previous failures. « The Most Befuddling Investment Decision is Currency FIRST!